Happy Valentine’s Week. 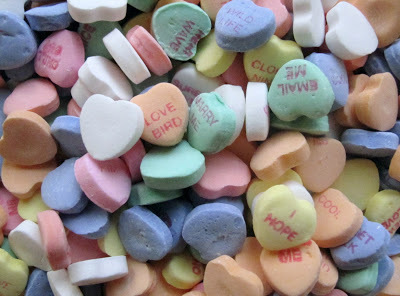 Thankfully, these candy hearts are only available one season a year. Unfortunately, that season begins — at least in the grocery stores — right after Christmas. I’ve exhibited some self-control, as this is only the second bag I’ve bought. Good picture! I haven’t bought any yet this year. But they are good!